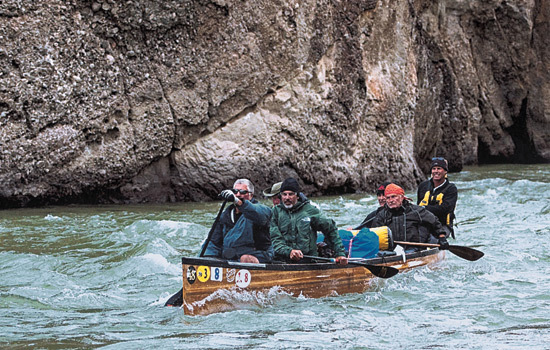 Tom Mayer, Tom Wyble, Tom Stern, Phil Saunders, Gerhard Munger and Rob Gunther compete in the Yukon 1000 Canoe and Kayak Race. E. Philip Saunders didn’t want his teammates to get wet and muddy. It was the last night of the Yukon 1000 Canoe and Kayak Race—the longest boat race of its type in the world—and Saunders’ six-man team, Sugar Creek Bears, had pulled into a muddy area to dock. Saunders, who at 73 was the oldest person ever to compete in the race, decided he would get out and build a dock out of driftwood so his teammates could stay dry carrying their gear out of the boat. The Sugar Creek Bears came in fourth place out of nine teams in the race this summer on the Yukon River that began in Whitehorse, Canada, and ended in central Alaska. Four other teams, with participants half of Saunders’ age, couldn’t make it to the finish line. The entrepreneur and namesake for the E. Philip Saunders College of Business says he knew he could complete the race even though it meant paddling in a 28-foot canoe from 6 a.m. until 11 p.m. for nearly eight days. There aren’t many things Saunders doesn’t complete. Saunders started his career in 1958 by opening Truckstops of America, a place where truckers could buy clothes, get a good night’s sleep and a hot meal. He came up with the one-stop shopping concept for truckers when working overnight shifts for the New York state thruway. He later sold the business to Ryder Systems Inc.
From there he has owned a variety of businesses, from Richardson Foods, which makes ice-cream toppings, to Sugar Creek Corp., a chain of gas and convenience stores, to Griffith Energy. His latest venture is Genesee Regional Bank and he has an interest in Western New York State Energy, the first ethanol plant built in New York state. Saunders lives in Dansville, N.Y., with his wife of 55 years, Carol, on their farm. Munger, 54, of Lowville, N.Y., met Saunders in 1996 after he bought his propane company, Gemgas, and Munger went to work for him. The two started talking about hunting and became good friends. Even though he had raced with Saunders before, Munger says he wondered whether his friend could complete such an extreme race as the Yukon 1000. The participation waiver even notes that expert paddlers could die because the race is so demanding, physically and mentally. In 2006, RIT received $13 million from entrepreneur E. Philip Saunders to create the E. Philip Saunders College of Business. In October, the RIT benefactor committed $5 million more and challenged alumni and friends to raise $15 million additional funds in support of the college’s endeavors. The money will be used to expand the school’s facilities by about 20,000 square feet, enhance technologies, create three endowed professorships and offer six graduate fellowships a year. RIT has six years to raise the additional $15 million. Saunders says his challenge is a call to action to the more than 17,000 alumni from the college.